I really enjoyed making this card. It is the first time I have used the PTI Rosie Posie set and can't wait to use it again. I really like the way the roses look in this set. I am entering it in the Play Date Cafe Challenge #121. I really like the colours, they are really pretty together. I will also put the card in the Simon Says Stamp Challenge, 'Anything Goes'. LOVE how delicate your card is Tracy! It's absolutely beautiful. What a beautiful card! LOOOOOOOOOVE your ribbon and I LOVE your layering of the flower/panels! BEAUTIFULLY done!!! THANKS for joining in the fun and playing along with us over at the PDCC:) And thank you for your sweet comment! HUGS! This is just GORGEOUS!! I have that set coming in the post and I can't wait to play. I haven't seen it used with pastels, you've made it look so very pretty! Thanks for playing along with us over at The Play Date Cafe!!! This is ever so pretty, Tracy! LOVE how you've created such delicious dimension, and that gingham frame is over the top! Thanks so much for playing along with us this week at The Play Date Cafe! Wow, such a pretty card!! 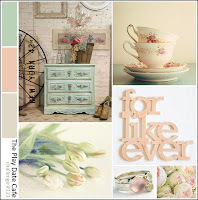 Beautiful stamps and I love the layering!! 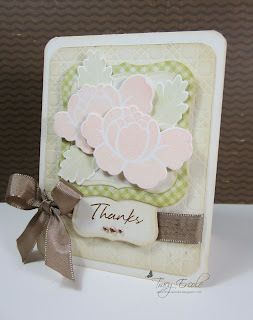 Thanks so much for joining us on the Simon Says Stamp Challenge blog.